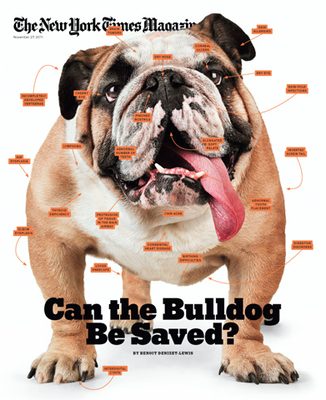 Sunday Edition New York Times: Can the Bulldog Be Saved? Anyone the least bit familiar with the breed knows exactly what this question refers to. The Bulldog has been bred and designed and tweaked into one of the most recognizable faces of the modern canine world. But with these manipulations has come a host of serious health problems. The dog’s unmistakable jowls and folds, flattened muzzle, and stanch under-bite render him prone to everything from severe respiratory difficulties to devastating neurological issues. And that’s just the beginning. The Bulldog can expect not only an abbreviated life expectancy and susceptibility to a multitude of health maladies, but a lifetime of discomfort. We (people) have literally wedged this animal into a body that isn’t made for living. So can he be saved? Continuing to breed dogs who adhere to the ideal standard as set by the Bulldog Club of America and the American Kennel Club — dogs that can neither reproduce nor give birth without assistance — is unnatural and irresponsible. Propagating a line of animals who can’t breathe, sleep, or move without considerable difficulty is downright inhumane. Yes we can save him, but we have no choice other than to adjust our expectations of the Bulldog’s appearance. With that answered, let’s address the bigger, more global question: When does humankind’s desire for a particular trait go from innocent to barbaric? When does our obsession with the perfect looking dog or most delicious cut of meat or fastest thoroughbred compromise the health and happiness of a living, sentient being? In preparing his article, journalist Benoit Denizet-Lewis interviews a wide range of self-proclaimed Bulldog lovers, from veterinarians to breeders to rescuers. While the medical professionals universally acknowledged innate and grave physical challenges with the current iteration of the Bulldog, many breeders and owners defended the animal’s form and function. Savannah attorney Sonny Seiler, responsible for selecting and caring for the University of Georgia’s live Bulldog mascot Uga, is steadfastly averse to any alterations in the look of the Bulldog. He tells Denizet-Lewis that changing the breeding standards would compromise the Bulldog’s distinctive appearance. I wonder: Since when is the look of a breed, important only to a handful of humans, paramount to the individual animal’s comfort, health, mobility, and life span? When does passion for a certain aesthetic or allegiance to a particular look get so fervent we mistake it for love? We humans convince ourselves that our dogs are happy if they’re making us happy. And while I’m sure that Seiler genuinely cares about his dogs, I have to think there’s a strong swell of denial surrounding him. Of the last two Bulldogs to assume the university’s mascot duties, neither lived past age four. Still, he insists his animals are happy, healthy, and well bred. Seiler goes on to stress that his dogs receive excellent veterinary care (an argument I’ve often heard with regard to animals forced into unnatural situations, such as competition or entertainment). And that may be so, but it’s a point I’ve always found moot. Professional boxers receive the highest caliber medical care, but it doesn’t mean that what they do to their bodies is not disastrous or correctible. At least they have a choice in the matter.